These juicy little bundles are the perfect thing for a girly get together (I brought them to book club) and can be dressed in a multitude of ways. I saw the green sugar in my pantry and grabbed it right away and it was cute but I’ll confess, it sort of melted into the cream cheese after these berries sat for a little while in the fridge. If I were to make them again, I would top them with something else. Crushed pistachios or graham crackers would be awesome as would shaved chocolate or even a mint leaf. How cute would a mint leaf be? 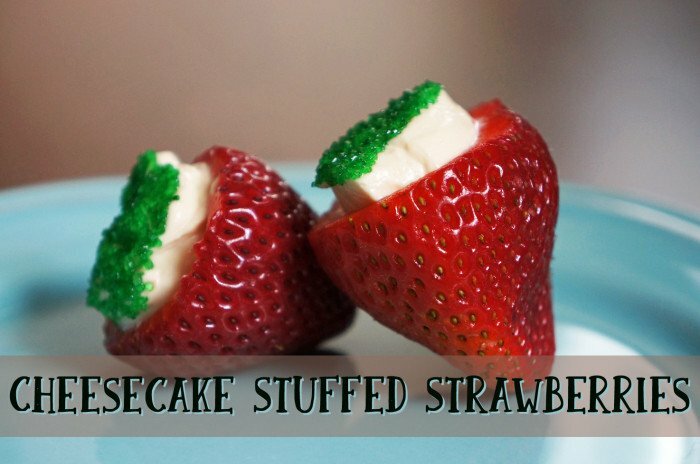 Cheesecake Stuffed Strawberries would be a nice potluck idea as you can make them ahead and they transport rather well. Plus, as long as it’s not super hot out, they are ok sitting out of the fridge for a while. In the bowl of a stand mixer (or you can use a hand beater) whip the cream cheese, honey, coconut sugar and vanilla together until smooth and a little fluffy. Transfer the cheese mixture to a piping bag or large zipper bag with one corner cut off. Squeeze the filling from your bag directly into the strawberries and fill a little higher than the edge of the berry. Dip into your topping. Repeat until all berries are full - this will make about 30 large berries. So yummy! And yeah, a mint leaf would be so cute. Every time I open my fridge today, I see the chocolate cream cheese and think of your strawberries! I might try a chocolate variation. seriously, that would be amazing! These look delicious and so easy. I think fine graham cracker crumbs would be awesome.